No one argues that price plays an important role in choosing outsourcing, but it should not be considered separately from other parameters. When choosing a vendor, do not just pick the cheapest possible; rather, be critical and take other factors into account. By being excessively economical, you risk losing much more money than what you have saved. When choosing a vendor look for a balance between price and quality. Otherwise you risk facing late deliveries, bad quality and technologies that you cannot change or improve. 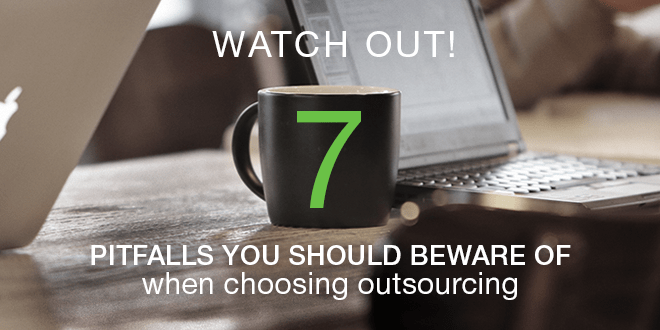 Let’s consider seven the most common problems with outsourcing. Remember, if you buy cheaply, you pay dearly. It can happen: a vendor misses the deadline, delivers work of bad quality or just disappears and stops answering your calls. Research the market and always check the references to avoid this problem with outsourcing. Ask former vendor clients for feedback. Pay special attention to aspects of the previous client’s project that might be relevant to your own. Fixed price is a pricing model that sets a single rate for the project, regardless of the time and expense. Time-and-materials, on the other hand, bills the customer for the hours spent on the project, as well as expenses incurred. The pitfall of a fixed-price contract is that if underestimated, the vendor may start managing costs and cut down expenses severely, which ultimately results in poor-quality work. Decide whether you prefer certainty and quality or the prospect of a lower bill. A vendor’s relationship with their clients reveals a great deal. So beware of outsourcing communication issues. If a vendor misses your calls using time difference as an excuse and does not get back to you, this is an early signal to be aware of when starting work with him. Consider changing vendors and do not rely on time to make it better – it never does. It is a common misconception that specialized vendors are perceived to be more professional. You still end up working with a developer with his expertise. As you grow bigger, you will experience a need for new technologies and you will have to attract teams from other companies. To avoid misunderstanding and controversy between the teams, it is better to choose a company that has expertise in diverse programming languages and frameworks. Allayo is a virtual health assistant, a comprehensive healthcare platform. All development resources were focused in Eastern Peak Software, which allowed the customer to develop a comprehensive web and mobile platform and take a leading position in the healthcare industry. A growing number of outsourced projects has prompted huge outsourcing companies to work as “conveyors” on standardizing all processes. Therefore, it is common that insufficient attention is paid to the specific clients’ features. A big company will not make concessions to a small customer and will more likely just skip him. This results in a drastic decrease in quality of the work delivered. Therefore, it is necessary to choose an outsourcing company that can offer a personal approach to your issue. Pay attention to medium-size companies with good references and reputation. As an extra benefit you will have access to a decision-maker that will help you to ease your work. A personal approach to each customer ensures the possibility of implementing unique high-tech product features that result in outstanding product quality, along with total end-user satisfaction. Since freelancers work individually, they face problems troubleshooting complex issues while programming because there is no one else nearby to help them. Freelancers are seldom prepared to take up even a medium-sized project – they can only take up projects which they can handle single-handedly within their individual capacity. In the worst-case scenarios, freelancers may just disappear in the middle of the project. Working with a R&D company with a decent pool of software professionals will help you to avoid this pitfall. Start right away! Contact us to get a free quote for your project.